MWTC offers three types of courses. Our nine core courses prepare students to test for National Home Energy Professional (HEP) Certification in the four WAP program job designations. For more information on HEP courses check out our Weatherization Program Courses page. For individuals who already hold HEP certificates, we offer Continuing Education Units courses (CEU) approved by Building Performance Institute (BPI). Completion of the course can count toward Home Energy Professional Recertification. Visit the Continuing Education Units page to learn more. Finally we offer in-depth trainings, including thermography, respiratory protection, HVAC topics and certification courses for lead and asbestos inspectors. Click on the course name below to see more information. You can also email the Center at Classes@weatherization.org for details and scheduling. 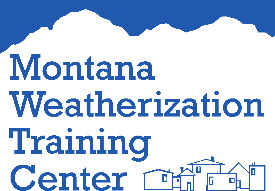 As an entity of Montana State University, the Weatherization Training Center is governed by the same policies as the main campuses. You can read the most relevant policies in the MWTC Student Handbook.